"Sampath Speaking" - the thoughts of an Insurer from Thiruvallikkeni: the fake imposter at Mandela's funeral... wrong gesticulation !! the fake imposter at Mandela's funeral... wrong gesticulation !! He has been identified ~ but is sounding murkier… !! I had posted on the outcry over the signs made by the interpreter at Nelson Mandela's memorial service – complaining that the official sign language interpreter was a fraud who was "signing rubbish". The man, suited and wearing a pass around his neck, stood next to key speakers such as US President Barack Obama and Mr Mandela's grandchildren translating their eulogies… He was wearing an official security pass around his neck during the event at the 95,000-seater Soccer City stadium in Johannesburg, which is now being questioned as some of the 91 heads of state attended the funeral. People state that they were really upset and humiliated by the gesticulations and movements of the mystery interpreter. The fake singer has been identified as ‘Thamsanqa Jantjie’… but the South African sign language interpreter accused of making up his own signs during a memorial to Nelson Mandela has revealed he may have suffered a schizophrenic episode on stage after claiming he saw 'angels' at the event. Thamsanqa Jantjie, 34, who has been violent in the past and suffers from schizophrenia, said that his hallucinations began while he was interpreting and that he tried not to panic because there were 'armed policemen around me.' He added that he was once hospitalized in a mental health facility for more than one year. What – the man is claiming to have suffered a schizophrenic episode on stage ! 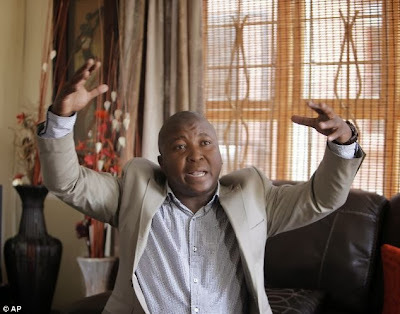 Mr Jantjie, who stood gesticulating near President Obama and others who spoke at Tuesday's ceremony that was broadcast around the world, insisted that he was doing proper sign-language interpretation of the speeches of world leaders. He said he worked for a company called SA Interpreters which had been hired by the ruling African National Congress (ANC) for Tuesday's ceremony at Johannesburg's 95,000-seat Soccer City stadium. He said he was paid 85 dollars (£52) for interpreting the event. But he also apologized for his performance that has been dismissed by many sign-language experts as gibberish. 'I would like to tell everybody that if I've offended anyone, please, forgive me,'Mr Jantjie said in his concrete home in a low-income Johannesburg neighborhood…… upon seeing the video footage of his own interpretation, he claimed not to remember anything at all. He also claimed that he suffered the attack, saw angels and wary of the armed police around acted in a manner not to embarrass his own country !!!.... the main is reported to be due on the day of the ceremony to get a regular six-month mental health checkup to determine whether the medication he takes was working, whether it needed to be changed or whether he needed to be kept at a mental health facility for treatment. It is stated that government officials have tried to track down the company that provided Mr Jantjie but that the owners 'have vanished into thin air.' Deputy Minister of Women, Children and People with Disabilities Bogopane-Zulu apologized to deaf people offended around the world by what they say was Jantjie's incomprehensible signing. She says an investigation is under way to determine how Jantjie received a security clearance. However, in a radio interview Mr Jantjie reportedly said he was happy with his performance at the memorial to the anti-apartheid hero. According to The Sun, Twitter users with sign language knowledge claimed the interpreter repeatedly used signs for 'donkey', 'lightning bolt' and 'prawns'. Eye Witness News meanwhile has reported trained sign language trainers said he also made reference to 'rocking horses'. Worser still is the fact that this man was reported to have been seen in a previous event as well. ANC has denied knowing about it although footage from two large ANC events last year showed him signing on stage next to President Jacob Zuma. Only time will tell… what the Govt investigation is all about … and how an imposter got so close to all Foreign dignitaries..
With inputs from Daily Mail and other newspapers.